This is 21st century and we all live in the age of the Internet. While some software developers claim to use it for the benefit of the customers they in fact only care about license protection benefits it can provide. Not many users realise that simply placing the Tool Data Base file on a shared network drive or service like DropBox or Google Drive will keep their Tool DB in sync on all of their computers running HSMAdvisor. Floating License allows users to run a single seat of HSMAdvisor on multiple computers non concurrently. All you need is internet connection! Permanent Licenses do not even need internet connection at all. Machine Profiles are important part of out calculator tool. Among other things they allow to prevent machine stalls and resulting machine damage and tool breakage. You can upload your Machine Profiles to HSMAdvisor Cloud for Public or Private access. Or you can request a machine profile to be added and I will upload it for you to easily download. All within the HSMAdvisor Machine Definition dialog! Cut Cloud. The place to get other Machinist's experience at your fingertips. Another great feature that we are actively developing right now is the Cut Cloud. It allows Machinists to share their cutting experience with other HSMAdvisor users. It is still in development but shortly we are going to populate out public online library (Cut Cloud) with cutting data from popular tool manufacturers. 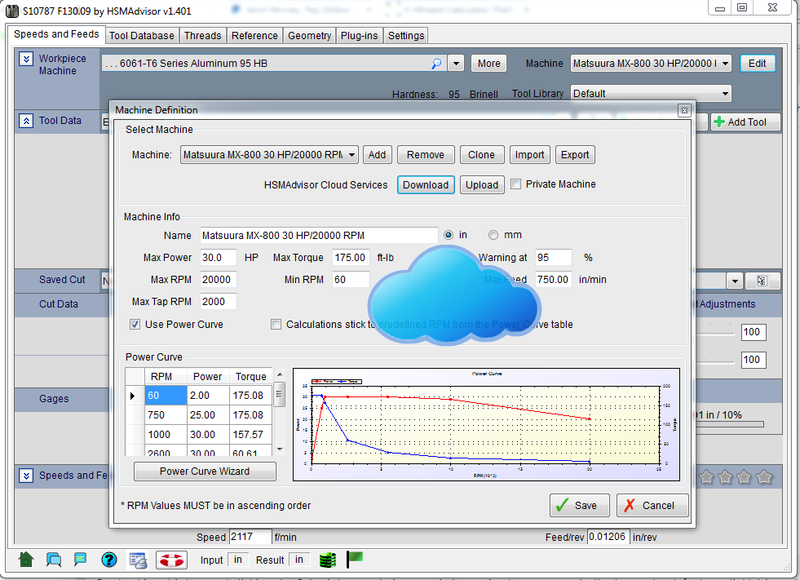 Anyone running HSMAdvisor will be able to just dial in their cutting tool, connect to the Cloud and see how others run their tools in similar cutting conditions on similar machines. A few times I got emails from disappointed machinists who were not aware of HSMAdvisor and thus chose a competing software product. They all were complaining about misleading Licensing schemes some software developers were using that hindered their work. Things ranged from not being able to register their seats for hours after completing the purchase to having to keep their computers online almost uninterruptedly (despite claims it could run offline for weeks) to keep their software running. HSMAdvisor uses transparent Permanent and Floating Licensing scheme that will not leave you hanging. All purchases are handled automatically and our new customers do not need to wait for a next business day to get their purchase functioning. We constantly work on making your experience as flawless as possible and do not linger on past achievements. There is a lot more work planned and already in progress. In the age when everyone is talking about how internet is turning the world around we are doing our small part in making it happen! Thank you, everybody for your support and feedback!